Like a lot of bloggers, peonies are my favourite cut flower. 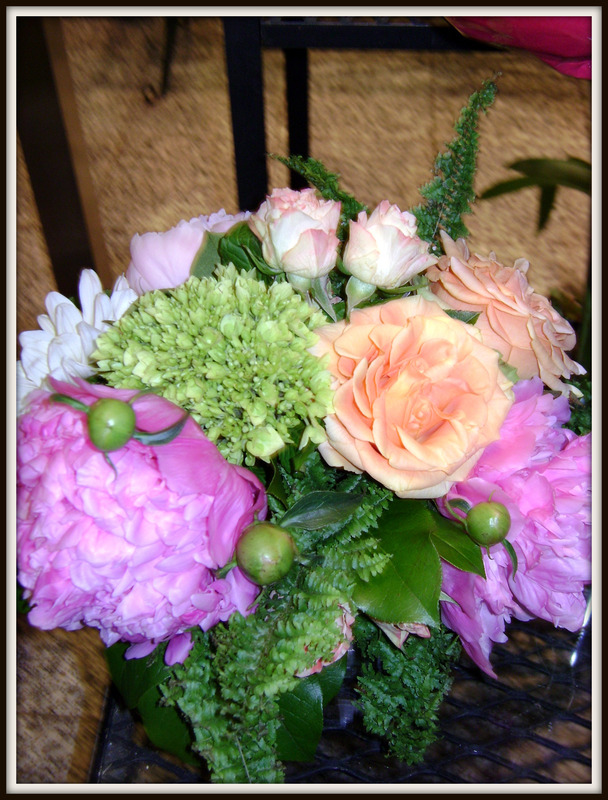 I could not wait for peony season to start when I was a floral designer, I loved them so. And one of the great things about wholesale flowers was the peony season in New Zealand. As our seasons are the opposite, I got cut peonies twice a year. Wow, this was taken back in 2009, when I first started blogging, my camera skills have improved since then. So, I made sure to plant a number of peonies at Kilbourne Grove, (and I am still planting, this year I purchased 2 Itoh peonies, Kopper Kettle and Bartzella, and a species, peonia rockii). 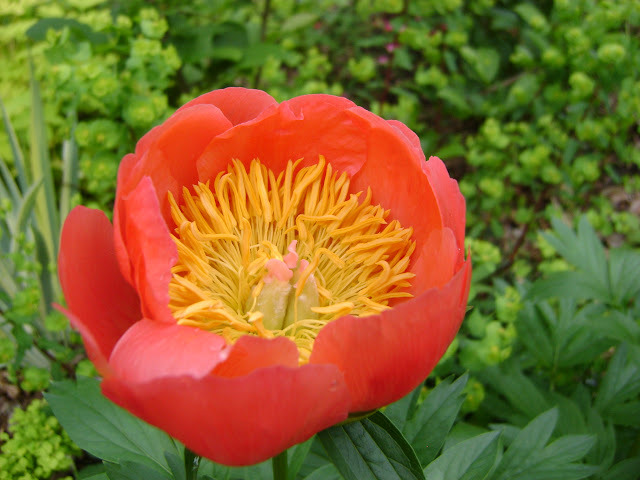 Teza also gave me a fern leaf peony when I saw him in the spring for our legendary (in our own minds) trip to Lost Horizons. There were 2 of the old-fashioned varieties at Kilbourne Grove when we purchased it, both double pinks, a light and a dark. You know, the kind that falls over in a rain, but oh so fragrant, and perfect for vases. But when I purchase them, I look for anything from singles to a semi-double. See how much Pink Hawaiian Corals colour changes as it ages, crazy. and a tree peony that I dug up from my parents house when my dad sold the property, an unknown pink. A year after my mum died, my father decided to sell the house. 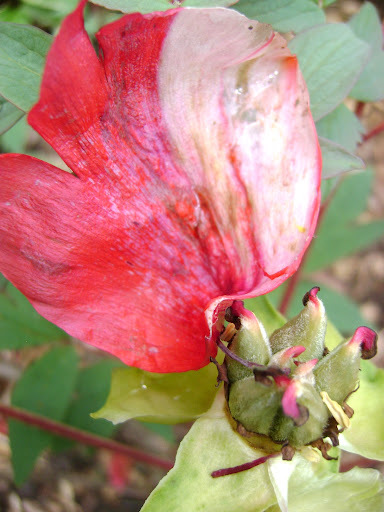 I really wanted something from my mothers garden as a ‘living memorial’, but the house was closing in March. This really limited what I could choose. Most of the perennials were not showing. But the snowdrops that my mum had originally got from my grandmothers garden were in flower and I could see where the tree peonys were. Even though it was really early in the season, I decided to dig them up. I figured that I was losing them anyway, so if they didn’t make it , I was losing them anyway. So, I dug them up as well as a vast quantityof snowdrops and helped move my father. The next day, I had to plant them in the ground. My parents had been living in Niagara (the banana belt) and my house is in Owen Sound. In order to plant the peonys and snowdrops. I had to remove 6″ of snow off the raised garden beds. Luckily, the soil was really soft under its fluffy, white blanket and I proceeded to plant. Things went well, they flowered a month later and were a lovely light and dark striped pink. Unfortunately, that fall, I ran out of time and did not have a chance to move them into a garden bed. This year, you can see what happened. I now have a scarlet hussy living in my garden. 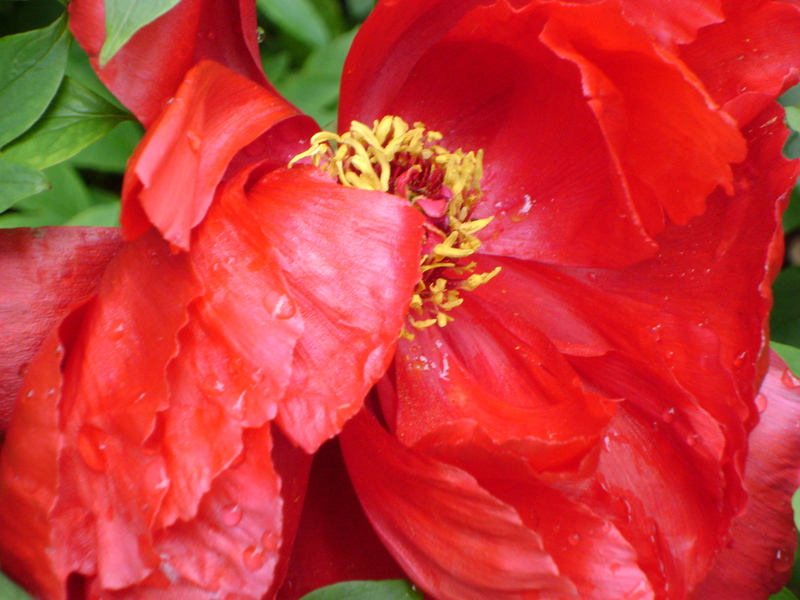 I do not know what happened, if this is from the graft of the tree peony, or if my mother is playing a joke on me, but she is luscious, like scarlet silk. But, I definitely have to move her this fall, and we will see what she decides she wants to be next year. Two weekends ago, I was lucky enough to visit Marion Jarvie’s Open Garden. If you have never been there, you should definitely take the time to visit. It is amazing! 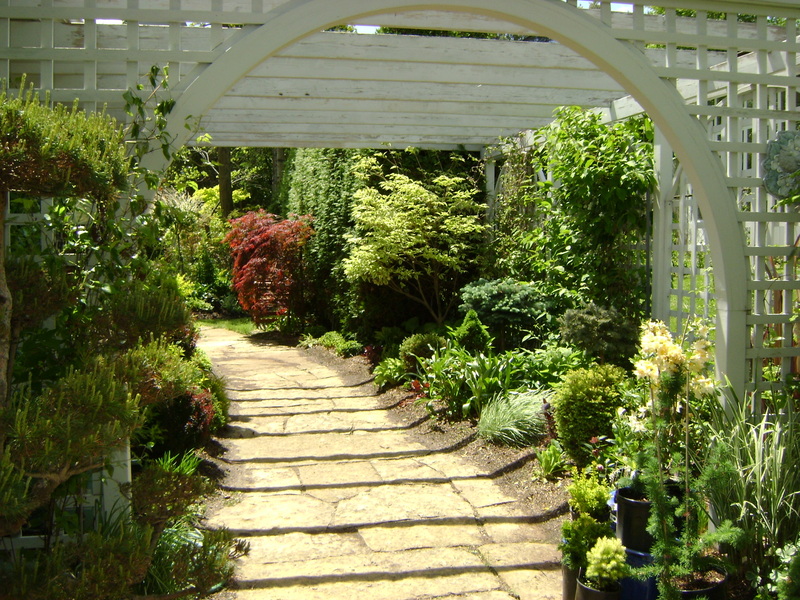 She and her husband open the garden four times per year, early spring, early summer, mid summer and late summer. 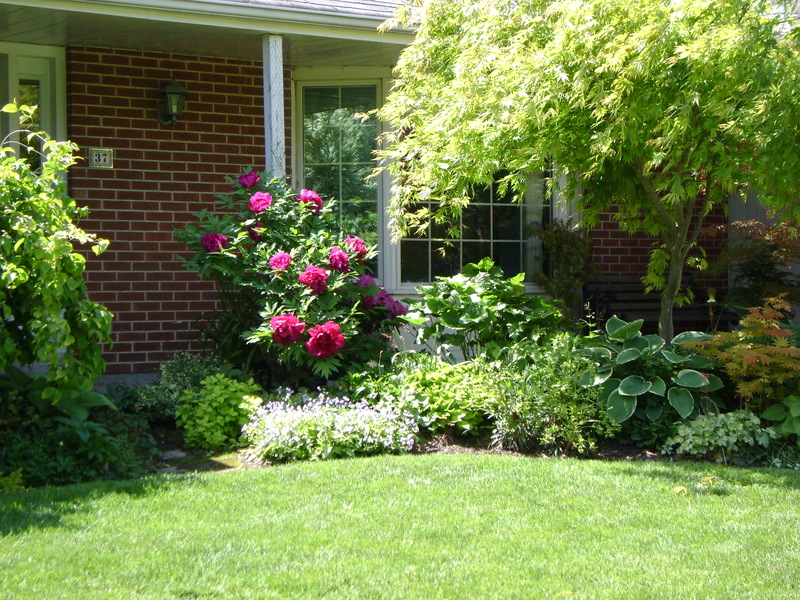 Every time it looks completely different as the focus changes from bulbs, to peonies, to perennials. I have taken a few courses and gone to lectures by Marion, but to see it in the flesh is a treat. Unfortunately, Marion was mobbed and I wasn’t able to get the variety of the plants, but let me show you a few pictures. Isn’t it amazing? 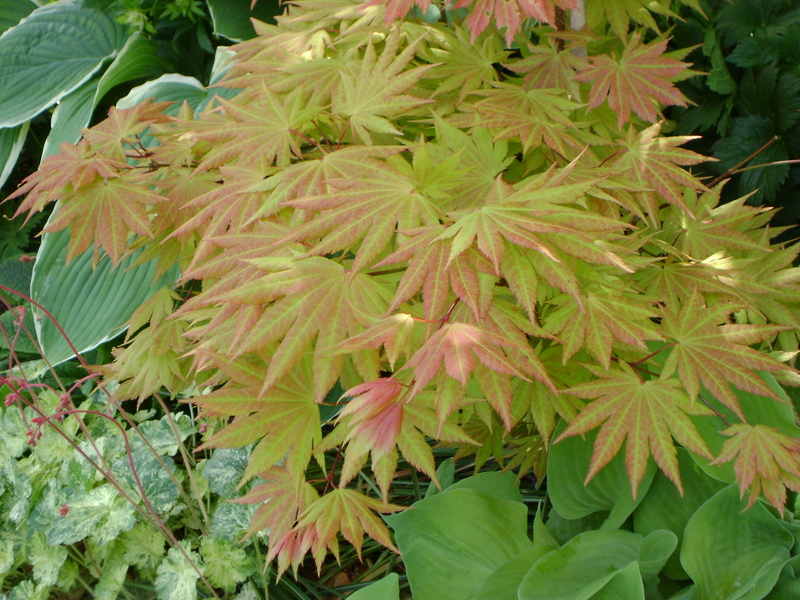 You can use a mix of perennials like the hosta and some tender plants. 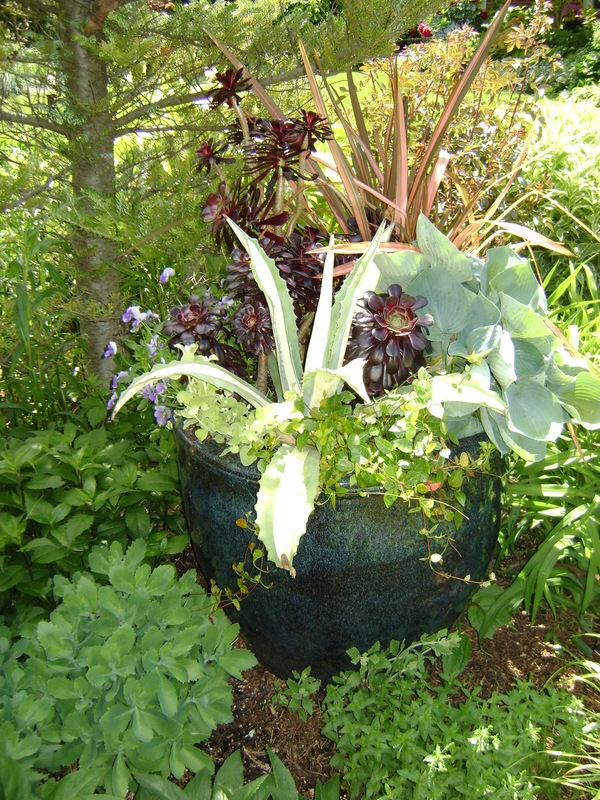 The agave, phormium can all be wintered over in the house and saved for the next year and the hosta can be planted in the garden. The next open date is July 18 and 19, and it is open from 10 to 4, rain or shine. 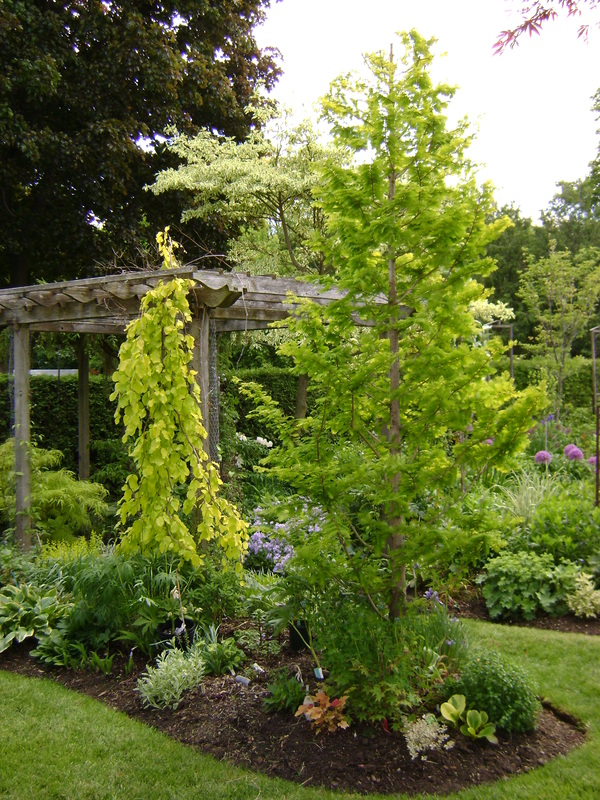 You can call the Toronto Botanical Gardens at 416-397-1340 and they will be able to give you the address. You will be happy you took the time!